The success of our business is intertwined with responsible stewardship of nature, the source of our products and profits. The success of our business is intertwined with responsible stewardship of nature which is the source of our products. As such, we continuously improve our agricultural practices and oversight of growers, and communicate our Environmental Policy to our stakeholders as we support sustainable processes to enhance our environmental footprint. Our Environmental Policy is updated periodically to reflect new advances in best practice and better serve the Group’s operating needs. This policy is posted in our facilities, communicated to facility management and also incorporated in our training for operations staff. In the US, Del Monte connects consumers with our growers by developing information pertaining to where their food is picked and packed at the peak of ripeness. To instil more confidence in our growing practices, the Company provides detailed information on how vegetables are grown through new sophisticated software and partnership with the Stewardship Index of Specialty Crops (SISC) organisation. As an active participant in SISC, we analyse on-farm metrics with growers, track and monitor agricultural inputs to drive continuous improvement, and gain efficiencies. Additionally, DMFI partners with a third party vendor, CropTrak™, to use their crop data management system to track traceability and sustainability metrics, and customer audit information. CropTrak™ allows us to house the data in one central repository to facilitate more dynamic communication with operations and partners. CropTrak™ also helps us improve our harvest and pack projections. The system is also a portal that can collect and disseminate contractual and educational information within the value chain, such as Good Agricultural Practices of our growers in planting cover crops and working with qualified agronomists. Our crops are locally sourced and travel less than an average of 160 kilometres from the field to the manufacturing gate and an average of 560 kilometres from distribution centre to retailer. DMFI is unique compared to our competitors because we have our own dedicated agricultural Seed Operations Research Team. Our plant breeding programme uses the classic method of selecting the best plant qualities to produce a new generation in an outdoor laboratory. The team provides growers with majority of our seeds for certain crops, including the Blue Lake, Romano and wax beans, and other crops such as peas, corn and spinach. We are able to generate a higher yield for our corn and green beans. In a single year, Del Monte tests over 3,000 genetically distinct, new and upcoming varieties in the hope of identifying a better plant that we can grow for years to come. We grow and evaluate over 1,500 green beans, 1,000 peas, and 500 corn which are genetically distinct. The strongest ones are advanced the following year into yield, harvestability, and quality plots in the nursery, and then to successively larger row and field plots. We move the best few varieties from test status to trial status over the next two years, to continue to understand their characteristics. If the variety performs consistently and fills a niche, we add it to the Del Monte Approved Variety List, scale up seed production to meet field department demand, and it becomes a standard variety used by Del Monte locations to produce quality Del Monte vegetables. As we work to identify key characteristics of our plants, we keep the viewpoints of our customers and growers in mind. Their insights around hardiness and taste provide the direction for the next generation of our seeds and products. Ultimately, we test for taste, harvest cleanliness, yield, disease resistance, nutrient management, and factory performance. In FY2018, we grew Del Monte seeds that had been developed and grown using these processes in 17,282 hectares of land. Of all the vegetables grown, 95% of beans, 50% of corn, 25% of peas, 100% of lima beans, and 75% of spinach use Del Monte seeds. The rest of the seeds are selected for the same traits by Del Monte’s research team, but are not our proprietary seeds. Our green beans are one of the greatest successes of our plant breeding programme. We have been able to improve the yield of our latest green bean variety every year since 1996 by understanding its water, nutrient timing, pest management, seed quality, soil type, plant density, timing, and overall growing habitat. In the Philippines, the foundation of DMPI’s sustainable agriculture practices is efficient land use. Ecologically-minded land use management was carried on from our pioneers who started farming in 1926. These pioneers did not clear forests to give way to pineapple fields. Additional land acquired later by our pioneers was already cultivated for other crops. Across over 90 years of operations, our land use practices are mainly aimed at improving plantation yield through ecologically friendly land preparation, plant disease management and chemical application, efficient water sourcing and drainage, and use of sustainable planting materials. 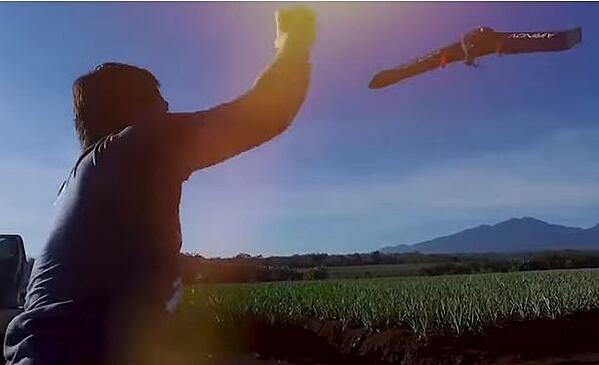 One of the projects implemented to maintain DMPI’s world class plantation management system was the Drone Programme which allows us to monitor the condition of the 25,000-hectare pineapple field in Bukidnon, Philippines. It captures pictures, including topography and colour, which help determine the health of the plants and optimise inputs of production. Global Positioning System (GPS) technology is also now being used to monitor the plantation and truck deliveries to ensure efficiency, productivity and safety at work. Part of our Quality Policy in the Philippines is our commitment to environmental standards and sustainability objectives, statutory and regulatory compliance, and continuous improvement of our quality system by adhering to the highest ethical standards within our operations and in dealing with our business partners. In the United States, DMFI is a leader in introducing agricultural practices that minimise the use of pesticides and help farmers grow stronger, more productive crops with less fertilizer, water and other materials. We help growers apply the principles of Integrated Pest Management (IPM) to minimise the amount of pesticides used to control insects, other pests and crop diseases. Del Monte field staff and growers closely monitor crop conditions through field scouting, pheromone traps and cultural tools to help avoid situations that could contribute to pest outbreaks. By limiting pesticide use, we reduce the potential for contaminated runoff from fields, protect the health of farm workers, prevent the destruction of beneficial insects and other field organisms, and ultimately decrease the chance that any pesticide residue remains on the crop when it is harvested and processed. We have participated in a number of IPM-related partnerships and initiatives to share knowledge and best practice. Del Monte researchers investigate crop density as a way to increase yield per hectare while cutting pesticide and fertilizer use. We continue to explore the possibility of rolling out high-density techniques to other crops. 1. DMFI provides our growers with plants that are naturally resistant to plant diseases and insects, thus reducing fertilizer and chemical use in farms. 2. Working with our growers to plant the best disease-resistant varieties for their regions, our field staff educate and solicit feedback from our farmers on how to best grow these plants and implement pest control and crop disease mitigation strategies. 3. Due to these improvements over the last 50 years, we have reduced our spraying from an average of 7 applications, with a total of 2 kilograms of active pesticidal ingredient, to 1.5 applications and 90 grams of active ingredient. 4. In addition, we reduced our application energy usage over 85% through such fewer applications. 5. Cutting down pesticide use at the source also helps us prevent pesticides from entering our fields and foods. We actively complete laboratory tests for pesticide residues for over 2,000 products each year. If we find any pesticide, we remove it from our products and the fields where our growers cultivated them. 6. This feedback loop means we closely examine the impact that new pesticides might have on our products, and that we develop higher standards of growing. 7. We continue to explore the possibility of rolling out high-density techniques to other crops. The agricultural sector uses 70% of the world’s accessible freshwater supply, and many countries are reaching, or have already reached, their renewable water limits. With growing climate instability resulting in increasing droughts and other water pollution concerns, water scarcity is quickly becoming a top issue in the agriculture sector and governs where plants are grown, placing limits on productivity. Managing water resources to maximise water efficiency, minimise pollution, and protect access to water for other users is truly a shared challenge for food processors. In the United States, our growers use various irrigation systems to supplement natural rainfall and ensure a steady and reliable water supply for their crops. Water scarcity is a real and pressing environmental concern. We work with our growers to implement the least water-intensive cultivation methods possible and encourage the use of more water-efficient irrigation systems and techniques to use less water. Our agricultural teams work closely with local farmers to adopt agronomic measures that can mitigate adverse consequences of crop agriculture on soil and water conservation. Responsible farming focuses on sustainable crop cultivation and efficient drainage systems, with innovative as well as tried-and-tested practices, including minimising build-up of surface water during heavy rain and positioning grass strips at strategic points to slow down water flow. We look for ways to optimise water use in all of our toll manufacturing operations, reduce water usage and increase water reuse and recycling. 1. In the US, Del Monte evaluates and prioritises water risk based on local availability and quality in areas where our plants operate, as well as at the farm level where we contract with growers. 2. From the time we plant to when we package the fruits and vegetables, water is a critical resource. Many of the regions where we grow and operate in are starting to experience water stress exacerbated by climate change. We see our concern for water scarcity reflected in stronger regulations and more calls to monitor and manage water use. 3. We work with our growers to implement the least water-intensive cultivation methods possible. For instance, 98% of Del Monte tomato growers utilise drip irrigation for targeted application of water and fertilizer. 4. Presently, 78% of our facilities have high or extremely high water stress, so it is imperative for us to use water sparingly. To the extent possible, we capture and reuse water at our facilities. 5. At most of our facilities, we recycle the cooling water from our cans and use it to run our cooling towers. By doing so, we reduce the amount of fresh water and energy we use. 6. DMPI uses the condensate (water from steam and pineapple juice) of our evaporators and permeate (water from mill juice) from our Reverse Osmosis (RO) system for Ultrafiltration System CIP and Ion Exchange Plants regeneration. These allow us to use less fresh water and avoid water treatment costs. 7. Of the 10 manufacturing facilities of DMFI, 78% of the sites in these regions have high or extremely high baseline water stress. 8. In the Philippines, our PET Plant Operations measure the Water Use Ratio (WUR), i.e. total cubic meter of water used per MT of finished product, or the volume of groundwater used per volume of beverage product. Our WUR in the PET Plant for FY2018 is 11.29, below the 11.87 maximum target. 10. Our toll manufacturers have water conservation programmes to eliminate waste and reduce water usage. Wastewater discharges of all toll manufacturing lines are within regulatory standards. WUR in beverage and culinary toll manufacturers are monitored and will be reduced each year. In the US, soil, along with seeds, is the primary medium of growth of our products. Poor soil health can have impact on the environment in the form of poor water retention, increased nutrient and chemical runoff, and declining yields. Maintaining proper soil health and nutrient balance are vital to producing healthy, high-quality fruits and vegetables, and addressing some of the world’s environmental challenges, including carbon sequestration. Since efficient management of soil directly impacts our long-term productivity, we are focused on regenerating topsoil and improving diversity, on the ground and even below the ground. Our plantation in the Philippines is Global Good Agricultural Practices (GLOBALG.A.P.) certified, further affirming a management system focused on Food Safety, Worker’s Health and Safety, Environmental Protection and Conservation of Wildlife. GLOBALG.A.P. is a globally recognised private sector body that sets voluntary standards for agricultural products. Our plantation and pack house for fresh fruits have been certified ISO 9001:2015 for growing, harvesting and packing of fresh fruits by SGS United Kingdom Ltd. Systems and Services Certification body. Our participation in the GLOBALG.A.P. certification process was voluntary and was a strategic response to customers’ demand for food safety worldwide. A Philippine Good Agricultural Practices (PhilG.A.P.) certificate issued by the Philippine Department of Agriculture also attests that our farms grow, pack and distribute fresh produce in conformance with international standards on food safety and quality. 2. DMFI encourages our farmers to work with qualified plant and soil scientists, or agronomists, who develop innovative farm practices and technologies. 3. These technologies are harnessed and implemented to boost crop yields, control pests and weeds, and protect the environment. Understanding the agronomics of a new variety in a growing area is important for adaptation to the environment. 4. In the Philippines, landholdings are leased by the Company from lawful landowners by virtue of their respective ownership or stewardship documents as attested by concerned government agencies. 5. DMPI installs soil conservation measures in pineapple fields. For better soil and drainage management, the Crop Growing Units implement deepening of ditches and install auxiliary canals and silting basins specially designed for each field. 6. Trees and shrubs are planted along river easement near pineapple fields to prevent soil erosion. 7. Our agricultural team conducts soil erosion studies and has developed a soil conservation manual. 8. We also reinforce technical competency through continuous training and education on soil management to reduce soil erosion in our plantation. 10. The Group cooperates with agrarian reform beneficiaries and the Philippine Department of Agrarian Reform towards efficient implementation of Comprehensive Agrarian Reform Programme. 11. Some of the soil conservation measures done in the Philippines are standardised basin design, using bamboo as check-dams following standard spacing and installation of back-slopes on roads. We face opportunities and risks associated with climate change. Predicted impact of climate change, such as increased temperatures, less reliable water supplies, and more intense extreme weather events, can significantly impact our operations and supply chain. DMFI’s approach to climate change is two-fold—we try to mitigate our greenhouse gas (GHG) emissions, and adapt our operations and supply chain to the potential impact of climate change. DMFI works with farmers on a variety of sustainability initiatives that help address climate change. DMFI’s plant growing programme helps develop drought- and pest-resilient seeds. The Company also directly partners with our growers through the Sustainable Food Alliance’s Cool Farm Tool. Several of our growers in Wisconsin and Washington piloted the tool to measure their GHG emissions and understand mitigation options for agricultural production. Del Monte Foods also minimises carbon footprint by locating our processing plants close to the fields where our crops are grown. The majority of our crops are locally sourced and travel an average of 160 kilometres from the field to the manufacturing gate, and an average of 560 kilometres from distribution centre to retailer. In the Philippines, we also closely monitor our carbon footprint. 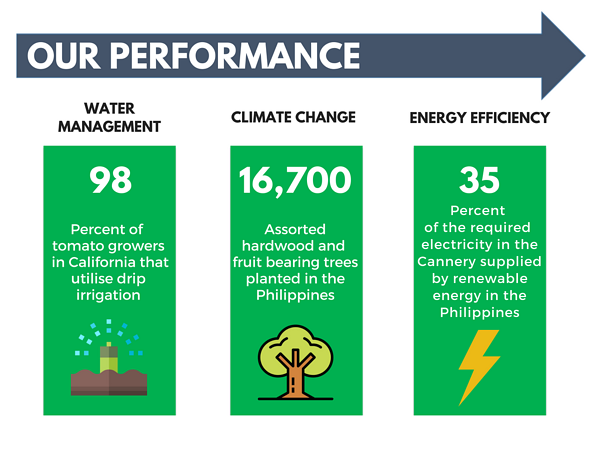 While most manufacturing companies, including food companies, are carbon positive, meaning they emit more carbon dioxide into the atmosphere than they sequester or absorb, the carbon footprint of Del Monte Philippines, Inc (DMPI) is negative. DMPI is the largest producer of pineapples in the country and its vast 25,000-hectare pineapple plantation and forest areas reduce the amount of carbon dioxide, offsetting any emissions in the atmosphere. There are not many companies that are carbon negative or even carbon neutral. Less carbon emissions are better for the environment. DMPI, a leading manufacturer of food and beverages, is uniquely positioned amongst food companies to help mitigate climate change. DMPI plants various timber trees in plantation camps, company grounds and facilities. Bamboos are planted along field boundaries and non-arable land. 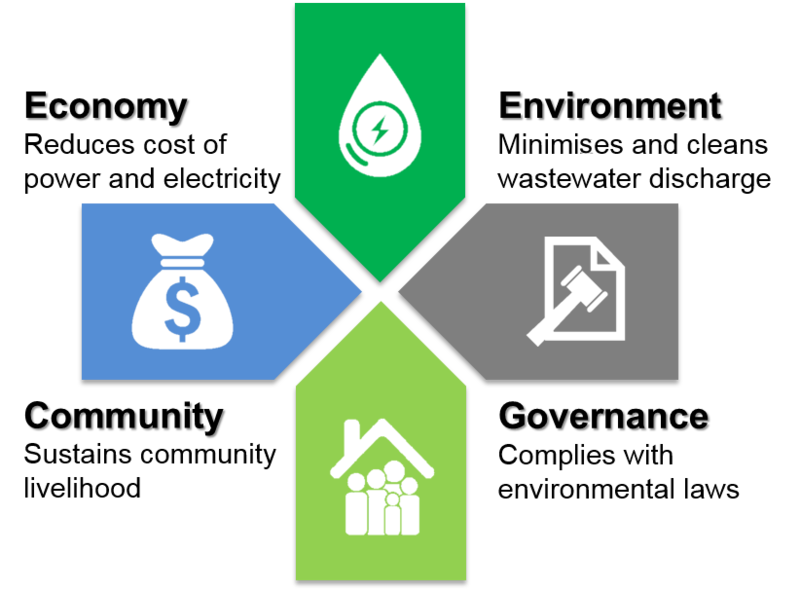 The Group continually assesses our investment opportunities in renewable energy solutions in each of our facilities. A number of renewable energy projects have been implemented across our facilities in the United States and Philippines. As early as 2009, DMFI installed 6,400 solar panels covering over 37 square kilometres and producing 1.8 million kwh which amounts to more than 8% of total electricity requirements during non-pack season at our primary tomato production facility in Hanford, California. The solar panel installation at our Hanford facility has enabled us to become a member of the Environmental Protection Agency (EPA) Green Power Programme. In the Philippines, Del Monte embarked on a renewable energy project that produces biogas using cannery wastewater. The waste-to-energy facility generates 2.8 MW of electricity. More significantly, cleansed water discharged at coastal waters of Macajalar Bay has Biochemical Oxygen Demand (BOD) levels below government mandated levels. The waste-to-energy facility supports our Company’s long-range plan for increased production which ensures 100% wastewater treatment, and serves as a shield against unstable power supply and power cost increases. We will continue to seek out energy reduction opportunities across all our facilities and invest in improvements that collectively reduce our air emissions, including GHG, and our operating costs. 1. In the US, Del Monte received the Greenhouse Reduction Award from the California Manufacturers and Technology Association and the Industrial Environmental Association. 2. As part of DMFI’s ongoing continuous improvement efforts, our Modesto plant installed a combined heat and power system, selective catalytic reduction unit, condensing economiser and backpressure turbine generator to its boiler system that cut natural gas use by 20%. 3. DMFI has a company-wide programme dedicated to implementing condensing economisers to improve heat recovery and steam system efficiency. At least 50% of our facilities utilise this technology and we continue to expand this programme across our other facilities. 4. Six facilities installed condensing boiler stack economisers to use hot exhaust gases from boilers to preheat water in a heat-exchanger system which improves the operating efficiency of the boilers by up to 12%, reducing the amount of natural gas needed to run the boilers by the same percentage. 5. At DMFI, we track total network miles as a way to determine the success of our efforts to reduce the distance our finished products travel between processing plant and store. Since 2015, we have eliminated 2.3 million miles or 3.7 million kilometres (the equivalent of approximately 1,476,310 litres of diesel fuel) from our distribution network through a variety of initiatives. 6. Del Monte in the Philippines embarked on a renewable energy project that produces biogas using cannery wastewater. a. This plant complements the job done by an equally eco-effective but power-intensive aerobic treatment plant. b. This plant highlights our commitment to environmental stewardship on reduction of our GHG in compliance with the Clean Air Act of the government -- recycling while enhancing our business competitiveness through reduced energy costs. c. This plant reduces the yearly energy cost of the company by approximately 40 million pesos because it is 20% cheaper than the grid which mostly relies on coal-fired plants. 7. In the Philippines, we received the Outstanding Award in the Don Emilio Abello Energy Effiency Awards in 2017. 8. By using the waste-to-energy facility in the Philippines, we have reduced 29% of the cannery’s power cost per kwh. In the United States, we are benchmarking our waste management practices and specifically comparing landfilling to recycling rates to ensure that we are managing our waste streams in the most efficient manner possible. We instituted a “Ner0 (Near Zero) Landfill” policy where we aim to divert up to 98% from reaching the landfill based on the Environmental Protection Agency’s Waste Reduction Hierarchy. In the Philippines, we are also committed to sustainable waste management across our operations. We aim to reduce the overall consumption and usage of raw materials in all facets of our operation, including toll manufacturers. In line with this, we encourage the reuse of materials in all areas of operation. We promote the concept of recycling and the benefits of utilising recycled materials. When disposal is the only option, we seek to dispose materials in an environmentally safe and responsible manner. We understand that the correct handling, storage and disposal of waste materials is essential to comply with environmental regulations and pollution prevention. Our pineapple pulp waste disposal system, a pioneering effort which started in the 1950s, converts a by-product of the cannery into feed for our cattle farm at the plantation. This helps us reduce waste and cut costs. 1. For over four years, we have been actively involved in the Food Waste Reduction Alliance which is a collaborative effort between the Grocery Manufacturers Association, Food Marketing Institute and National Restaurant Association. 2. Our Walnut Creek Research Centre (WCRC) in California received a “RecycleSmart” Award from the Contra Costa Solid Waste Authority for our food waste recovery efforts. 3. The WCRC diverts the food and packaging materials of unused food through the manual opening of pallets of non-donatable packaged food, recycles the container and sends the food to compost for energy as part of a local restaurant programme, Food Recycling Project. 4. Our WCRC is also certified as a Bay Area Green Business due to its efforts to conserve water, energy and waste, implement eco-friendly materials and engage employees in conservation behaviour best practices. 5. We operate effluent treatment plants that treat wastewater discharged from our agro-industrial facilities. 6. Our high-filtration extraction system processes excess juice into pineapple concentrate and syrup, significantly reducing volume of wastewater. 7. Plantation-based families share in our total conservation effort as they segregate domestic solid waste right in their own homes. Recyclable materials collected from households are sold to fund community projects. 9. Our PET Plant Operation in the Philippines implements a solid waste segregation programme in order to capture recyclable wastes and sell them as scrap materials. 10. All toll manufacturers in the Philippines practice waste segregation, and waste management is part of new employees’ training of our toll manufacturers. DMPI ensures that all toll manufacturers comply with water and smoke discharge regulations. The Under our sustainability framework, we have significantly enhanced our stakeholder advocacy programme for environmental conservation. In the Philippines, our carbon footprint remains carbon-negative. However, we continue to undertake many initiatives during the year to reduce process residues, strengthen energy conservation in all worksites and plantation homes, and explore more efficient energy sources. 1. Del Monte Foods and its leading shippers have successfully completed 2016 emissions reporting with the US Environmental Protection Agency SmartWay Transport Partnership. 2. DMFI piloted the Sustainable Food Alliance’s Cool Farm Tool in Wisconsin and Washington. 3. Del Monte imports and exports about 10% of product from Asia. All of Del Monte’s contracted ocean container carriers are members of the Business for Social Responsibility’s Clean Cargo Working Group. The organisation works to monitor key environmental performance indicators and reduce carbon emissions through optimisation and efficiency best practices. 4. Through its coffee production project, the Del Monte Foundation is able to assist 22 families who maintain the 3-hectare coffee farm in Bukidnon, Philippines. It will take 2 more years for the coffee plants to bear fruit and be harvested. 6. Part of our CSR initiatives of our toll manufacturers are the Waterbody Programme and Quarterly Orchestrated Clean-up by the Department of Environmental Natural Resources-Environmental Management Bureau. The theme was World Water 2018: “Nature for Water”. Pro Foods International Corporation, one of our tollpackers, was assigned the Butuanon River for continued protection and revitalisation of our adopted rivers. 7. Our PET Plant has the Environmental Compliance Certificate ECC-R4A-1504-0291 and Laguna Lake Development Authority Clearance PC-20a-016-00199. 8. The PET Plant is an active member of Cabuyao River Protection Advocates. 9. Clean-up Day and Adopt-A-Creek Projects were also conducted in the Philippines. 10. 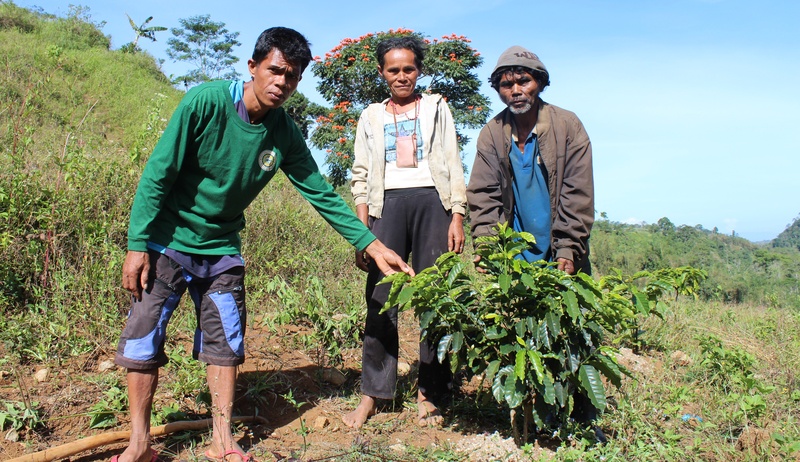 Our tree planting programme in Mindanao, Philippines, started using mostly endemic tree species seedlings sourced from nurseries sustained by local indigenous people to provide a haven for wildlife to flourish.